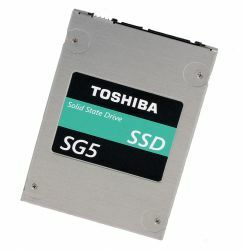 SG5 is Client SSD using Toshiba TLC NAND flash memory. Delivering a storage capacity up to 1,024GB and a 6.0 Gbit/s SATA interface, the SSD is engineered for desktop and notebook PCs. Further features of the series include the QSBC ECC technology from Toshiba for error correction and reliability. The versatile SSD family is also available in thin, space saving M.2 2280 form factor and standard 2.5-inch type case.